When one of Joan's former co-workers is missing, it leads to an illigal drug trial with dying or missing participants. Watch Elementary Season 3 Episode 9 to find out who is behind this killer drug. A former co-worker of Joan's is missing, and Sherlock takes the case as an excuse to avoid his sobriety meetings. Kitty updates Joan on Marissa's disapperance and mentions that Sherlock has been skipping his sobriety meetings. Sherlock texts the two of them to join him where Marissa's credit card was last used. He finds her body in a nearby dumpster and an unknown drug in her pocket. The DNA under her fingernails identifies her killer as Chris Jacoby. He is also missing, but they catch a glimpse of him on a survelliance camera, appearing disheveled and homeless. When they find his encampment, he had been murdered. He had suffered severe brain damage and had the same unknown drug in his system. Sherlock realizes Marissa administered the drug to Jacoby as part of an illegal drug trial. Based on the number of dosages, Marissa was carrying, there are four other participants with the killer drug in their system. Joan confronts Sherlock about missing his sobriety meetings and he confesses that he is struggling with the tedium of his recovery. Who is behind the illegal drug trial? What is the drug meant to do? WIll Sherlock slide back into old habits? 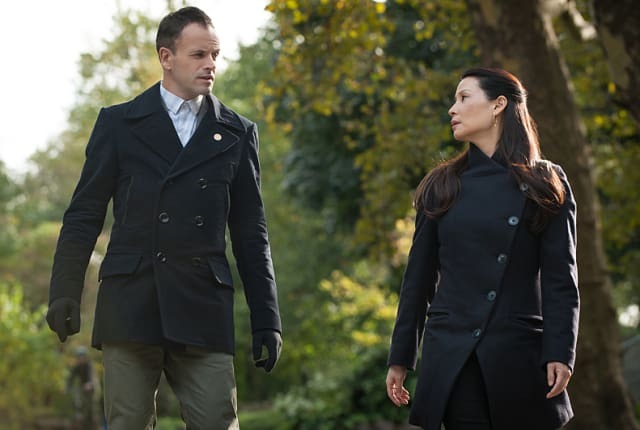 Watch Elementary Season 3 Episode 9 online via TV Fanatic to find out the answers. On Elementary Season 3 Episode 9, a former co-worker of Watson's goes missing and she joins forces with Holmes and Kitty to solve the case. You know better than to ask me a non-specific question. Permalink: You know better than to ask me a non-specific question. Now I think if I were to use drugs again, it would, in fact, be an anticlimax. It would be a surrender to the drip, drip, drip of existence. Permalink: It would be a surrender to the drip, drip, drip of existence.